Jessica is a recent graduate of the University of Ottawa having obtained her Honours Bachelor of Arts degree in psychology (French immersion) with a minor in social sciences of health, as well as her Certificate in Law. Additionally, Jessica has received her Second Language Certificate from the University of Ottawa and has completed the DALF C1 examination, which acknowledges international recognition of her proficiency in French. Jessica is fluent and capable to serve clients in English, French and Spanish. She will be pursuing her Master of Arts in Public Ethics in the fall of 2014. 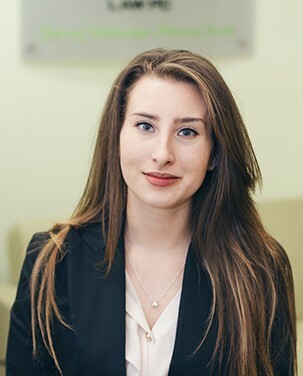 In addition to her internship, Jessica is presently working for the University of Ottawa at the Faculty of Engineering as a Financial and Research Administrative Assistant for the Photonic Technology Laboratory. She is responsible for performing an abundance of administrative tasks and monitoring several finance accounts, in order to make conscientious decisions regarding the group’s financial dealings. Prior to working at the University of Ottawa, she was employed as an office intern by Mitchell, Bardyn & Zalucky LLP, a law firm based in Toronto, where she gained skills in transcribing legal diction along with filing court documents and monitoring case dockets. Furthermore, Jessica takes great pride in the myriad of volunteer positions she has held. Some of which include, being the campaign manager for a candidate for the 2011 municipal elections, she has volunteered at The Ottawa Mission and Shepherd’s of Good Hope, and she was a camp counselor at Peacekeeper Camp Park for kids with disabilities. In her humanitarian efforts, she has been acknowledged by the Duke of Edinburgh Award, an internationally recognized program for young adults, in respect to service within her community. She is currently a national member and VP Finance for the University of Ottawa chapter of Equal Voice, a multi-partisan group focused on electing more women to all levels of government in Canada. In her spare time Jessica is an athletic and fitness enthusiast having dedicated a lot of her time to sports such as swimming, yoga, zumba and fencing. She is a second-degree black belt in Tae-Kwon-Doe and has obtained her NLS, an advanced aquatic certification, which allows her to be a lifeguard and/or swim instructor. Jessica also enjoys travelling and she intends to take full advantage of any international exchanges or opportunities that may arise in the future.